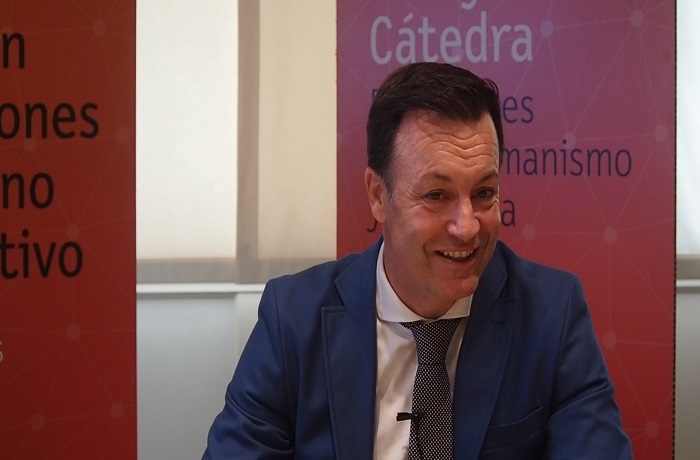 Florent Amion, managing director of Vygon Spain, was the guest speaker at the last “Desayunos Cátedra” session of the academic year. Under the title “Dreaming of an optimistic hospital”, Amion presented one of the company’s main social initiatives. The speaker began the session by explaining that, “what really moves us is this desire to transform people, the professional world and society”. In the case Vygon, this latter point is reflected in the Fundación Hospital Optimista [Optimistic Hospital Foundation]. This initiative contributes to improving the health of hospitalised patients by promoting initiatives and/or practices that help create an optimistic atmosphere for patients and their family members. The French multinational Vygon, an enterprise engaged in medical and surgical material, has been active in Spain for the past 40 years. It has its head offices in Valencia. In 2014, the company implemented the Management by Missions model, which they used to structure their entire organisation. “It has really transformed the company and enabled us to go about our daily activities with greater passion and elaborate a more humanistic management system”, explained the senior manager during the session. Management by Missions has completely revolutionised Vygon and helped them become more visible to society, by, among other things, helping health organisations and, in turn, patients. During the event, Amion presented the book Soñando con un Hospital Optimista, una guía para redescubrir tus superpoderes y transformar tu organización en un Hospital Optimista [Dreaming of an Optimistic Hospital: A Guide to Rediscovering Your Superpowers and Transforming Your Organisation into an Optimistic Hospital]. Amion is co-author of the book along with José Fonseca Pires, head of the Department of Human Behaviour for all AESE organisations (IESE Portugal). This was the last “Desayunos Cátedra” session of the 2017-2018 academic year; an initiative that is organised by the Chair for Management by Missions and Corporate Government at UIC Barcelona.